What is Nature's Variety Instinct Canned Cat Food? 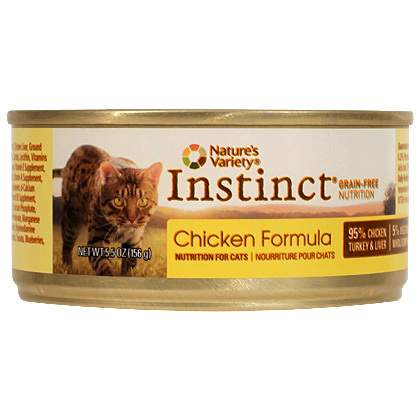 Nature's Variety Instinct Canned Cat Food is sure to appeal to your cat's carnivorous nature. It provides cats with a food Made with high-quality protein, vegetables, fruits, and other wholesome ingredients. Nature's Variety Instinct Canned Cat Food is suitable for cats at all life stages. It is also highly digestible and nutritionally dense, which makes it a great option for cats with sensitive stomachs. Mix it with dry food for the perfect combination of the things your cat needs and loves. Instinct is also grain- and gluten-free, which makes it an excellent choice for cats who are intolerant or sensitive to gluten or grains. Nature's Variety Instinct Canned Cat Food provides your cat with a well-balanced, grain-free meal that is not only delicious, but also provides essential vitamins and antioxidants to help your cat feel healthy and energized. Added Omega-3 and Omega-6 fatty acids also help maintain healthy skin and coat. Days 1 & 2: Feed 75% previous dog food and 25% Instinct Canned Cat Food. Days 3 & 4: Feed 50% previous dog food and 50% Instinct Canned Cat Food. Days 5 & 6: Feed 25% previous dog food and 75% Instinct Canned Cat Food. Day 7: Feed 100% Instinct Canned Cat Food. Ingredients: Chicken, Turkey, Chicken Broth, Chicken Liver, Ground Flaxseeds, Montmorillonite Clay, Eggs, Peas, Carrots, Lecithin, Vitamins (Choline Chloride, L-Ascorbyl-2-Polyphosphate, Vitamin E Supplement, Niacin Supplement, Vitamin B12 Supplement, Vitamin A Supplement, Thiamine Mononitrate, Biotin, Riboflavin Supplement, d-Calcium Pantothenate, Pyridoxine Hydrochloride, Vitamin D3 Supplement, Folic Acid), Dried Kelp, Potassium Chloride, Tricalcium Phosphate, Salt, Taurine, Minerals (Zinc Proteinate, Iron Proteinate, Manganese Proteinate, Copper Proteinate, Sodium Selenite, Ethylenediamine Dihydriodide), Artichokes, Cranberries, Pumpkin, Tomato, Blueberries, Broccoli, Cabbage, Kale, Parsley. Ingredients: Lamb, Lamb Liver, Lamb Broth, Ground Flaxseed, Montmorillonite Clay, Eggs, Tricalcium Phosphate, Peas, Carrots, Lecithin, Potassium Chloride, Vitamins (Choline Chloride, L-Ascorbyl-2-Polyphosphate, Vitamin E Supplement, Niacin Supplement, Vitamin B12 Supplement, Vitamin A Supplement, Thiamine Mononitrate, Biotin, Riboflavin Supplement, d-Calcium Pantothenate, Pyridoxine Hydrochloride, Vitamin D3 Supplement, Folic Acid), Dried Kelp, Salt, Taurine, Minerals (Zinc Proteinate, Iron Proteinate, Manganese Proteinate, Copper Proteinate, Sodium Selenite, Ethylenediamine Dihydriodide), Artichokes, Cranberries, Pumpkin, Tomato, Blueberries, Broccoli, Cabbage, Kale, Parsley.